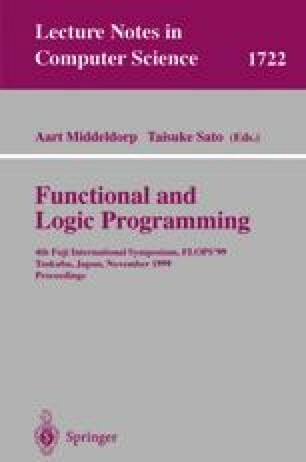 We describe a new approach to higher-order narrowing computations in a class of systems suitable for functional logic programming. Our approach is based on a translation of these systems into ordinary (first-order) rewrite systems and the subsequent application of conventional narrowing strategies. Our translation is an adaptation to narrowing of Warren’s translation, but unlike similar previous work, we preserve static type information, which has a dramatic effect on the size of the narrowing space. Our approach supports sound, complete, and efficient higher-order narrowing computations in classes of systems larger than those previously proposed. This work has been supported in part by the National Science Foundation under grant CCR-9503383.